Years ago someone in New York sent us a box of David’s Cookies. Back then David’s Cookies were considered “gourmet” and unique because they had chocolate chunks instead of chips. They were rich, crumbly and came in a neat tin, but that’s about all I can remember. The company has changed over the years and I suppose the recipe has too, but there are lots of copycat recipes claiming to be similar to the original. One such David’s Cookies recipe is from Maida Heatter’s Cookies , where Maida says her recipe is David’s. Whether it is or isn’t, the cookies are worth making. Maida’s version of the David’s Cookies recipe doesn’t have baking soda or powder so the cookies have a texture similar to but slightly heavier than shortbread. A key point in the recipe is that the chocolate must be high quality chocolate and not chips. Maida stated that David used Lindt, which I also like to use in some recipes because it melts so nicely and set ups soft. 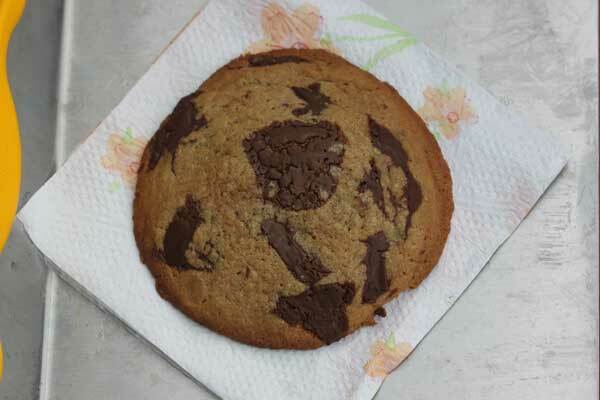 Maida also says you can make the recipe as jumbo cookies, so I tried that too. Both versions were very good, but I kind of preferred the giant cookies. If you try the recipe, let me know. I included some notes on measurements, grams, etc. As always, the best way to measure is with a scale. Update: I still love this recipe, but I almost always make the large version using 325 (see the note). Also, Bob’s Gluten Free Flour works great! Just follow the directions as written, but weigh out 250 grams of GF flour. If the cookies spread more with your GF flour, push the edges inward with a spatula while the cookies are still hot. 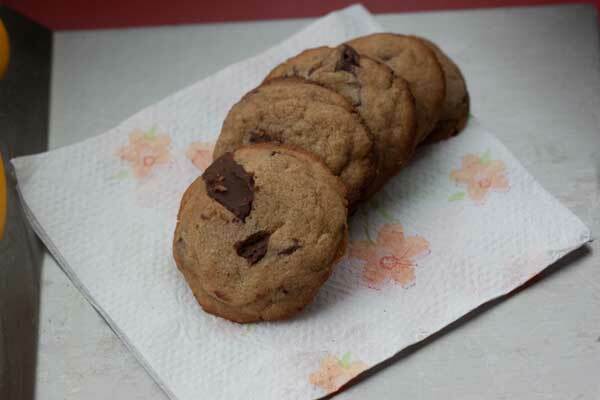 This recipe is suppose to produce cookies similar to David's Cookies from the 1980s. I'm not sure they are very much like David's at all, but they have an interesting texture thanks to the missing baking soda. Using high quality chocolate that melts as it bakes (like Lindt) is key. Don't even bother making these with regular chocolate chips. Beat the butter until creamy, then add the salt and vanilla. Scrape sides of bowl and add the sugar. Scrape side of bowl again and add the egg, then beat until blended. By hand, gradually stir in the flour until blended. Stir in the chocolate chunks. Using a rounded teaspoon, scoop about 40 (or slightly more) drops of dough onto foil lined plates or a foil lined baking sheet. Chill the dough thoroughly, then when it is cold and firm, shape the mounds of dough into neat balls. Preheat the oven to 400 degrees F. Line a baking sheet with parchment paper (do not attempt to grease it as this makes the surface too slippery and the cookies will spread and burn). If you don’t have parchment, you can use a Silpat or plain foil. Arrange dough balls 2 ½ inches apart on a baking sheet and bake for around 7 minutes or until edges are brown and centers appear set. Remove from oven and let sit on the baking sheet until the cookies can safely be transferred to a wire rack. Let cool completely. Notes: Maida’s original recipe calls for 2 cups sifted all-purpose flour. This could be 8 oz, 8 ½ oz or 9 oz. Theoretically a cup of sifted flour should weigh 4 oz, but mine range between 4 and 4 ½, so I experimented and had good results using 8 oz and good results using 9. The cookies looked prettier with 9, but were richer with 8. 8 1/2 oz is a good in between. If you don't have a scale, just sift, measure and go with 2 cups sifted. The recipe calls for a cup of light or dark brown sugar. I made some cookies with light and some with dark and liked both. The cookies made with dark spread a little more but had a great flavor. The cookies made with light had a nicer shape. To make giant cookies, follow the directions but divide the dough into 10 big chunks and chill. Shape into neat mounts, then set three mounds on a parchment lined baking sheet. Press down to about ½ inch thickness and bake for 20 minutes or until done. Maida baked her giant cookies at 350, but I had better luck baking mine at 325 for about 20 minutes. That makes total sense! They probably used something like Plugra or President brand butter — something with a high butterfat content. They might have even used “dry butter” which is what French pastry chefs use. Years ago I found the original Davids cookie recipe and had them made at our wedding. What I do know is that it used a higher end butter that is hard to find. Good luck finding the original recipe! Hey There BB! I hope you are doing well. Thanks for the comment, and it’s great to hear from you. Let me know what you think of the David’s Cookies. They’re different, for sure. I’m curious to hear what you think. Glad you liked the old Rice Krispies recipe. wow, those look great. I was just looking for something to bake today. I just made your brownies with Rice Krispies and they were great!